Gateway provides a number of services to people who live with a disability and their families, the professionals who support them, and community organizations and schools. 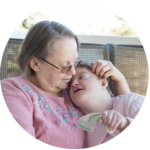 At Gateway, we empower people with disabilities and their families to live full, authentic, meaningful lives. This is the main focus of our workshops for families, staff, professionals, and the community. Family mentorship is the core of what we do at Gateway. Our organization was founded by families who came together to create change in our community. We continue to draw on the knowledge, support, and experience of families in our day-to-day work, while providing regular opportunities for families to come together. Gateway provides support for people who choose Family Managed Services funding through Alberta Human Services. We offer workshops for funds administrators and staff, along with one-on-one support. Our family support team is here to help you and your family navigate medical systems, educational systems, and government services. Our team has a broad range of knowledge in a variety of areas, such as: how to apply for funding, how to appeal a decision, and how to work within various systems. Gateway offers customized presentations for schools, businesses, nonprofit organizations, service providers, and others, on topics such as: building diverse and inclusive communities; disability awareness; the work we do; and the supports we provide. Gateway’s online Resource Library holds a multitude of resources for people who live with disabilities, their families, and those who provide support. Browse, print, or save any resource you need, including downloadable workbooks. Contact us to access family support services.